It’s happening, everyone. I think there's finally a game you really do need a PlayStation Vita to play and a Vita game you’re really going to need to play—at least judging by the first couple of hours I’ve played of this stunning game. Credit the LittleBigPlanet people, Media Molecule, I guess. They happened to think of a great new visual style for a game—a word build of construction paper—and a great fourth-wall-breaking hook: the characters of the world in their colorful game aren’t just aware that you, a giant human being, are interacting with their world, they can see you: in the world of Tearaway, you are the sun. The circular bright thing in their sky is you! Just rotate the camera up and see for yourself when you play. That’s a live video feed of your face in the sky, captured in real-time by the PlayStation Vita’s front-facing camera that’s facing your face. It's not a still photo of you up there in the sky. It's video. You can smile at these people or scowl at them. 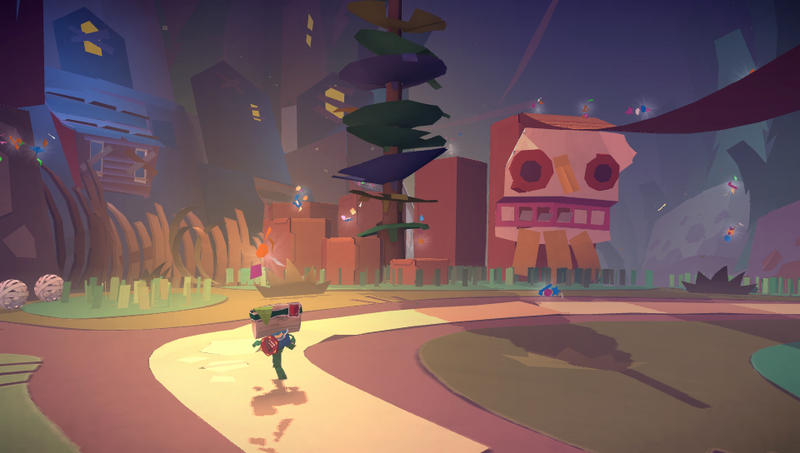 Tearaway is functionally a simple 3D platformer about a character called Iota the Messenger (he's got an envelope for a head; and he can be a she if you'd like). You use the Vita’s twin sticks to make Iota walk, jump and roll through his construction-paper world. Nothing special there, though this world he's in looks and sounds amazing. What is special is that, as you cradle the Vita in your hands and move Iota around, you’re able to tap the Sony handheld’s back touch panel to seemingly poke your fingers into Iota’s world. Using the rear touch panel, you can moving obstacles out of Iota's way, or, at times, treat the ground beneath his feet like a trampoline and bounce him to new heights. Other Vita games have played with ideas like this, but never this well and never with so much effort applied to make it feel like you're touching a virtual world. As you tap the back panel, you may see a photorealistic version of your fingers poking into the world from behind the machine. Between the finger thing, the sun thing and the characters constantly talking about the "Yous" out there, you will feel like you are connected to this virtual world, that you're not just seeing it but touching it. It's a magic trick, but it's also magical. The gameplay in Tearaway isn’t terribly complex, but the creativity on display is irresistibly charming and inviting. Players are empowered to decorate Iota and parts of his world by cutting and affixing various virtual paper constructs. And as you explore, you will unlock online directions for cutting and folding real-world papercraft versions of creatures and things in Tearaway’s world. We the players show up in the game’s virtual world to help decorate it, and we are made to feel like Tearaway’s characters step into ours to give some added color, too. It’s like there’s a cultural exchange between our world and a video game land. It’s distinct, lovely and refreshingly tactile. It’s also a great idea. I’ve not played all of Tearaway. I've just played the first five acts, which may amount to a quarter or a third of the game. I’m smitten and also impressed that a game I'd seen before and not been blown away by could seem to be coming together so well. I haven’t been this pleasantly surprised by a fall game since I first got a take-home copy of Portal in late 2007. I don’t expect Tearaway game to be that good (To clarify for those stumbling on this line: Portal's tough to match! ), but it’s certainly as pleasingly distinct. And while I’m not yet ready to say that Tearaway mandates a purchase of a $200 gaming handheld, I can say that the game is unimaginable on any other platform. It is going to be an important game to experience. So, figure out if you can get to a Vita at some point and make a plan to try this game. Tearaway will be launching on November 22, the same day as the Wii U’s flagship Super Mario 3D World, the 3DS’ flagship Legend of Zelda: A Link Between Worlds and Microsoft’s new Xbox. But even on possibly the busiest, noisiest gaming day of the year, it should still command your attention. Bonus preview fact: I’m sure that players of Tearaway studio Media Molecule’s previous games will be happy to know that the jumping in Tearaway is pretty good. It’s not floaty (little big victory!). This preview was based in part on a hands-on, unsupervised playthrough of a five-level build of the game on a retail Vita. It took a couple of hours to play through. To contact the author of this post, write to stephentotilo@kotaku.com or find him on Twitter @stephentotilo.